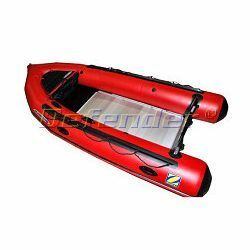 Boat: 4' 7" x 2' 6" x 2' 1"
Floor 3' 5" x 2' 5" x 7"
The Futura Models feature Zodiac's exclusive patented hull with speed tubes, or inflatable rails, under the boat to provide lift and reduce surface drag. This unique design reduces shock in choppy water and allows for a fast and comfortable ride. You'll be grinning ear to ear from the remarkable handling and directional stability the cathedral hull shape provides as your Futura slices through the water.